Oscar Lopez Rivera's unique ability to unite Puerto Ricans in a decolonization process is the real reason he's being attacked in the media. It was a peaceful day, full of joy and celebration. CBS News affirmed that despite the controversy, over a million people participated in the 2017 National Puerto Rican Day Parade last Sunday. The New York Daily News reported that former political prisoner Oscar Lopez Rivera received “a hero’s welcome” at the event (even though the later print edition of the tabloid ran a misleading front-page sidebar falsely suggesting that he was booed along the route). The controversy centered around plans by the parade committee to give Lopez Rivera the title of “National Freedom Hero.” In response, the multinational business community, including Coca Cola, AT&T and other corporations, pulled funding and sponsorship from the parade. Within the diverse and sometimes-divided Puerto Rican community, however, there was little disagreement that Lopez Rivera’s attendance at the event was cause for excitement. A beloved and unifying figure, Lopez Rivera — the longest held prisoner in the history of U.S.-Puerto Rican relations, who was commonly referred to as “the Mandela of the Americas” — had recently, finally been freed. The disconnect between Lopez Rivera’s role in Puerto Rico and the diaspora — and how he is mistakenly perceived, even among some progressives, within the United States and elsewhere — showcases both the colonial cultural/political divide between the two peoples, as well as the tremendous organizing involved in his case. Outside of the Puerto Rican community and nation, Lopez Rivera is seen by some as a freedom fighter to be defended at all costs, by others as a misguided advocate of ultra-left armed actions, who nonetheless deserved release on humanitarian and human rights grounds, and by others as a straight-up terrorist. Among the people of Puerto Rico, though, support for Lopez Rivera is decidedly not a controversial subject. Some surely disagreed with the tactics used decades ago by the organization to which he belonged; others may disagree with one or another of his political positions. But after more than 35 years behind bars, Lopez Rivera is as admired a figure as a top celebrity or artist — appealing to common folks across generational, class and ideological lines. The grassroots campaign built especially over the past 15 years reached every town and village, with ardent support for Oscar’s release coming from the pro-statehood mayor of his hometown and the pro-commonwealth Gov. Alejandro Garcia Padilla, who visited Lopez Rivera in prison. An “Oscar in the Street” aspect of his freedom campaign saw life-size cut-outs of his image spread across the island during the last years of his incarceration, and organizing among women’s groups, young people and the religious community helped make Lopez Rivera a household name, with hundreds of thousands of petitions signed calling for his unconditional release. While it is true that the campaign reached unprecedented international proportions for a U.S. political prisoner, with Pope Francis and a half-dozen Nobel Peace laureates joining the pressure campaign on Obama, the re-branding of Lopez Rivera as a “terrorist” by those seeking to disrupt the June 2017 parade raised doubts among some about Lopez Rivera’s positions regarding violence and social change. As the recently-elected national co-chair of the pacifist-oriented interfaith Fellowship of Reconciliation and a former chair of the secular nonviolent War Resisters League, I can understand initial concerns and confusion. Since 1992, however, those involved in the Fuerzas Armadas de Liberación Nacional, or FALN, and many of the armed groupings of the 1970s have stated that changing conditions warranted changing tactics; some began strongly advocating the use of militant nonviolent direct action (which was widely used in the successful campaign to get the U.S. Navy base out of the Puerto Rican island of Vieques). Although never even accused of any acts of violence, Lopez Rivera himself spoke and speaks repeatedly about his personal devotion to the sanctity of life, and how the only time that has been challenged is when he was a soldier in Vietnam. Even in that chaotic experience, Lopez Rivera is certain there is no blood on his hands. Yet after it was clear that the FALN were taking a different path than their original tactics — which included largely-symbolic bombings of empty buildings — it has been recently repeated that Lopez Rivera refused a 1999 clemency offer because he was unwilling to renounce violence. Although this refusal is exactly what kept Nelson Mandela in jail for 27 years (convicted of the same “seditious conspiracy” thought crime), and the right to take up arms against crimes against humanity such as colonialism is enshrined in the U.N. Declaration of Human Rights, the 1999 refusal is simply more media misinformation. When offered clemency under the Clinton administration, Lopez Rivera joined all his co-defendants in pledging (again) that they would neither engage in nor advocate acts of violence — and they have lived up to that agreement in both letter and spirit. Those released in 1999 are peacemakers, coalition-builders and inspiring artists and activists working productively in every region of the island. And Lopez Rivera was not released at that time in large part because he refused to accept the draconian conditions of staying in prison 10 years longer than the rest. He also protested the fact that some among his co-defendants were offered no deal at all. But there is much more than a simple concern about violence and nonviolence behind the current efforts to discredit Lopez Rivera. Within the War Resisters League and Fellowship of Reconciliation, members were thrilled at the successes of the Oscar campaign and anxious to welcome this man who has said since his release that the movement has “transcended violence.” We understand that social change does not take place in a fixed historical moment, that people and movements grow and mature, and certainly that it is the primary job of those of us from the colonizer’s side to get out of the way — tactically, strategically and otherwise — of those fighting for their freedom. Self-determination and solidarity is our most important priority. Consistent repression, incrimination, incarceration, black-listing and economic devastation are also acts of state-sponsored terrorism, directed — in the case of Puerto Rico — most intensely at pro-independence advocates. Often led by U.S. intelligence agencies, especially the FBI, those acts would rarely be labeled terrorism, though they have been responsible for more violence and death than any action taken by armed militants. It is terrorism to live in fear of U.S. Navy bombs being tested and dropped on one’s homes, but the people of Vieques faced that reality for decades. Although the “independence option” has always been a third-place loser on the electoral front, there is plenty of evidence that a vast majority of people believe Puerto Rico to still be a colony, unsatisfied with the current status and unconvinced that previous “votes” on the status question have been anything more than a sham, held by and for the non-Puerto Rican overseers in Washington. The plebiscite held on the same day of the 2017 parade may have seen a majority of votes favoring Puerto Rican statehood, but the big news was that over 78 percent of the eligible voting population stayed away from the polls altogether. Independence advocates, commonwealth supporters, and many others waged a far more successful boycott of the vote than Coca Cola and the corporations waged of the parade. Since the first moments of his release, Lopez Rivera has been clear that he will use his uniquely unifying position to build towards a trustworthy and legitimate process of decolonization. “First,” he carefully explained, “I want to travel to every village and town, to listen to what the people have to say.” This first step in the building of his new foundation is straight out of Gandhi’s playbook; the noted Indian independence leader traveled through the Asian subcontinent before he formulated detailed strategies for a friendly separation from Britain. “The campaign for my release,” Oscar reflected, “was the third of four waves of successful campaigns.” The first wave helped free five nationalists, imprisoned in the 1950s and freed under President Jimmy Carter’s administration. The second was Bill Clinton’s 1999 decision to grant clemency to a dozen Puerto Rican independence activists. The final, according to Lopez Rivera, will be the freeing of the island nation itself. This is, of course, the real reason the ultra-elite of the island and their U.S. corporate backers hate him so. Lopez Rivera has the possibility of uniting an unprecedented and historical number of people in a decolonization process that will conform to the standards of international law and accepted democratic practice. In all decolonization processes monitored by the United Nations and international accredited bodies (including the ones led by President Carter), certain conditions are required before a vote can be called legitimate. These include freeing all political prisoners held by the colonizing power, the one condition now almost fully met. Also included is a withdrawal of all colonizing military powers, an idea far from complete, with U.S. bases essentially surrounding the island and the sprawling Roosevelt Roads base taking up a substantial portion of arable land. Although the U.S. armed forces seem ever-present on Puerto Rico (the Marines served as the government of the island for the first years following the 1898 U.S. invasion), the question of outside intervention and its effects on the electoral process can’t be overlooked. It will take some time for Lopez Rivera to complete his homeland tour, as will any true transition process on status. The dire economic situation, with teachers unable to get paid a livable wage and unemployment at record highs, make the fuse on the Puerto Rican time bomb — far more deadly than any 1970s explosive — an incredibly short one. Meanwhile, in New York for his historic first visit, Lopez Rivera speaks of peace. 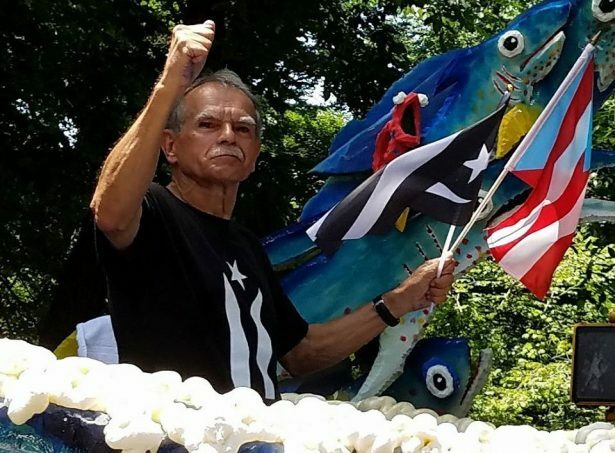 Honored with a position at the front of the throng of cheering parade-goers, he rode a float designed by Puerto Rican artisans to appear as a scene “by the water’s edge” — a reference to the locale the 74-year-old patriot missed most during his close to 36 years behind bars. While he did not accept the “national freedom hero” title that the National Puerto Rican Day Parade committee had wanted to bestow upon him, there was little stopping the outpouring of love and affection for this archetype so beloved by his people. Lopez Rivera noted that he preferred to march as an ordinary Puerto Rican elder and grandfather and to bestow the titled honor on all the people of his homeland and those allies who fight with them for justice and freedom. He, therefore, neither wore the special sash designating him as an honoree, nor marched with the other honored parade grand marshals or dignitaries. Of course, some in the corporate media — careful to remain faithful to their Trump- and Breitbart-aligned backers — still suggested that there were many who booed Lopez Rivera, a lie easily transparent to any who (like me) walked with his contingent all the way up Fifth Avenue. There were maybe half-a-dozen at most who criticized Oscar along the route. Those same reporters suggested an overwhelming majority of Puerto Ricans back on the island had just voted in favor of statehood, despite the extraordinarily high stay-away rate. 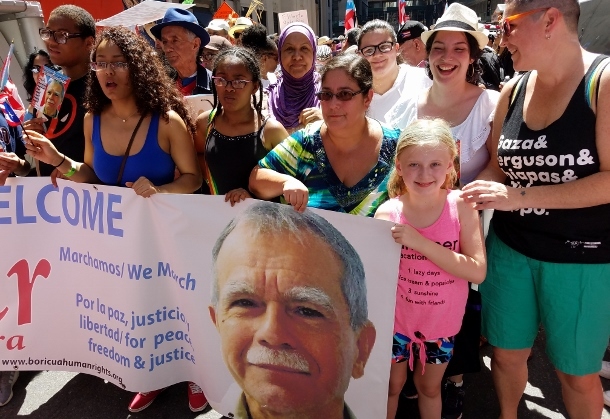 For those of us who have gotten to know Oscar Lopez Rivera, it is hard to escape the feeling that we are in the presence of both a great, transcendent figure — having made and about to make history, and a cherubic grandfather type, sweet and caring and giving of his time and energy. As organizers, however, we know that while it is nice to gain friends and family, it is more important to wage effective campaigns that will end injustice and give us reason to celebrate for more than one sunny Sunday afternoon. Oscar Lopez Rivera and the movement he comes out of are described clearly in this article. This is important as the misinformation spewed in the normal media about Oscar is dangerous. The way this piece touches on the issues of state violence and all of our strategies to confront it is crucial for us to understand. Great piece by a magnificent writer! How can anyone honor any person who has helped to kill innocent people. Maybe I’m naive. People are not upset with Oscar Lopez Rivera because he is for Puerto Rican independence or because he is a socialist. People are upset because the organization he worked with , the FALN took credit for detonating a shrapnel bomb in the Fraunces Tavern in 1975 killing 4 and injuring 40. An act he at least acquiesced in and certainly not a symbolic bombing of an empty building.As a paramedic, I’m against detonating shrapnel bombs in public places. People like me have to respond and confront the carnage unless of course a secondary device goes off designed to kill people like me. I’ve always thought the goal of any human liberation movement is to end human suffering and pain, not spread it and share it. Dear Vince, You and I have respected one another for many decades now, and I respect – more than ever – your life-saving work as a paramedic, as well as your even-handed political sensibilities. I don’t think you are naïve at all. What I don’t understand is your insistence on repeating a point which you have ALREADY WON – decades ago! As Oscar and his compatriots stated and repeated, and I have restated again here as clearly as I thought possible: there is NO ONE advocating the detonation of any kind of bomb in any space by anyone – NOR HAS THERE BEEN FOR MANY, MANY YEARS NOW. All self-respecting people – from Mandela to our founding fathers and beyond – are cautious about doing full repudiations of past actions (especially when the injustice those actions were designed to confront continue in as egregious a form as ever). But anyone paying attention here can tell that AT VERY LEAST OSCAR LOPEZ RIVERA, and all those whose sentences were commuted in 1999, regret the loss of life at Frances Tavern. For myself, I find it necessary to add: Oscar has paid a higher price for an action which he had nothing whatsoever to do with (expect maybe, for a short time, “acquiescence”) than any individual I can think of. At what point do we all get to say: a mistake was made over 40 years ago by people he probably knew; a terrible cost in human life and years behind bars was paid but they can’t be brought back. The time has come to reconcile and move on. Dear Vince, I truly do not think – not for a moment – that you should modify your already correct perspectives on the sanctity of human life and liberation, working as we do to curtail (eventually hopefully end) all human suffering. But I DO THINK you should seriously re-consider whether people are “not upset” (as you say) about Oscar’s steadfast position on Puerto Rican independence and decolonization. This is his most consistent position—his most deeply held belief. This is what is at the root of the crisis, when corporations who seek to profit from an already-economically devastated people are forced to confront a popular leader who seeks real and realistic alternatives. You, my dear buddy, are a true anomaly—maybe not alone, but certainly one of the few actual heartfelt pacifists whose concerns about those decades-old tactics still come to the fore. I wrote this piece in part out of respect for you and those politics. I write this reply in a similar vein. But I must admit to finding other critiques, from those willing to condone all manner of structural violence, at best callous and at worst an intentional diversion to confuse people into going along with their own continued oppression. Let us find common ground in the struggle to find lasting peace through justice, finding liberation through peaceful decolonization which will enjoy the nonviolent solidarity of the entire world—as did the struggle against racist apartheid in South Africa. If such a movement is now to be built Oscar Lopez Rivera is going to be one of those at the center of building it. Vince, I am glad that we are having this “conversation” in the pages of Waging Nonviolence—an appropriate place for this exchange, And I don’t think it is so Utopian to think that the sentiments expressed above can be realized today. I am glad to read that there still is space for a transcendent truth to emerge, The truth is, as I think we both agree, that colonialism is an awful crime and that—though fighting against the colonialism still ferociously inflicted by our own government against the people of Puerto Rico must end now. We both agree that human life is scared. And we are not the only ones who agree with this. Our own nonviolent fore-mothers, Ruth Reynolds and Jean Zwickel, were living in a Gandhi-styled Ashram in Harlem when they learned about Puerto Rican nationalist Pedro Albizu Campos who was hospitalized nearby due to radiation poisoning contracted during his years of political imprisonment. “Why,” Don Pedro challenged, “do you show support for the independence of India, but not for the colony of your own imperial government?” Reynolds and Zwickel spent the rest of their lives as friends of Don Pedro and stalwart north american solidarity activists, organizing support within the U.S. for the Nationalist Party and for Puerto Rican independence.